AM I NEXT? TOUGH TIMES AHEAD? — AM I NEXT? AM I NEXT? TOUGH TIMES AHEAD? With the current political and economic climate, I thought now might be an excellent time to repeat one of my poems that speaks to a central truth about financial bubbles and the repeat of past cycles. The poem first appeared in a post titled “The Ways of Wall Street: Circles within Circles” that was posted on November 26, 2007. When all the investors are broke, and the game begins again." Increasing political corruption and pandering to the special interests. Valuations that are outrageous in terms of revenue, profits, assets, and prospects. Increasingly arcane accounting, legal, and business advice from name-brand organizations where new associates do much of the research and recommending. Celebrity executives who are fronting for dysfunctional organizations, but who employ competent personal publicists and public relations teams. Famous people as board members who lack business experience or even fundamental knowledge of the enterprise. Insolvent companies that are bailed out by additional rounds of capital infusion. Tolerance for activists and agitators without consequences. 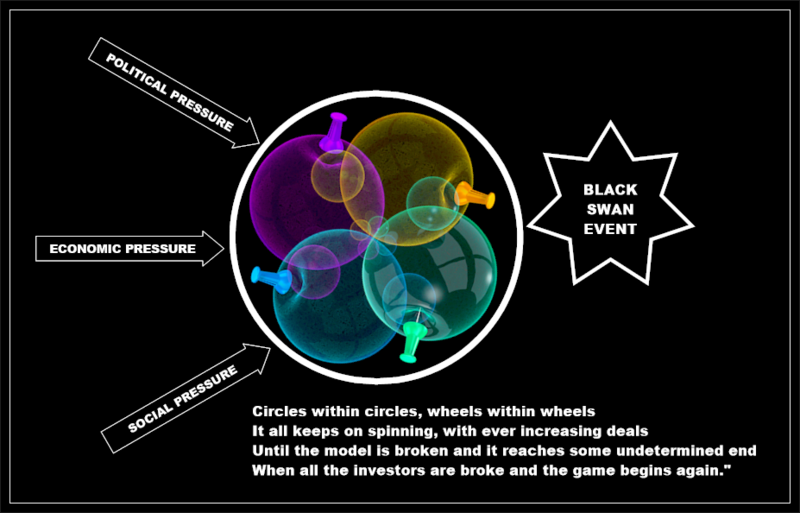 All it will take to burst the bubble is a single unbalanced force, be it political, social, economic, or even an unpredictable "black swan event."